TGIF! 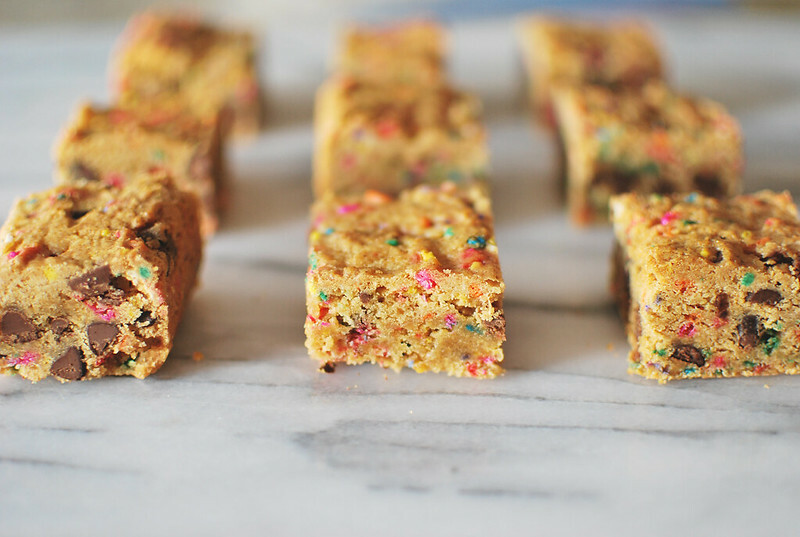 To get this long weekend started on a FUN note, I wanted to share this Funfetii Chocolate Chip Blondie Bar recipe that I tried my hand at this past week. 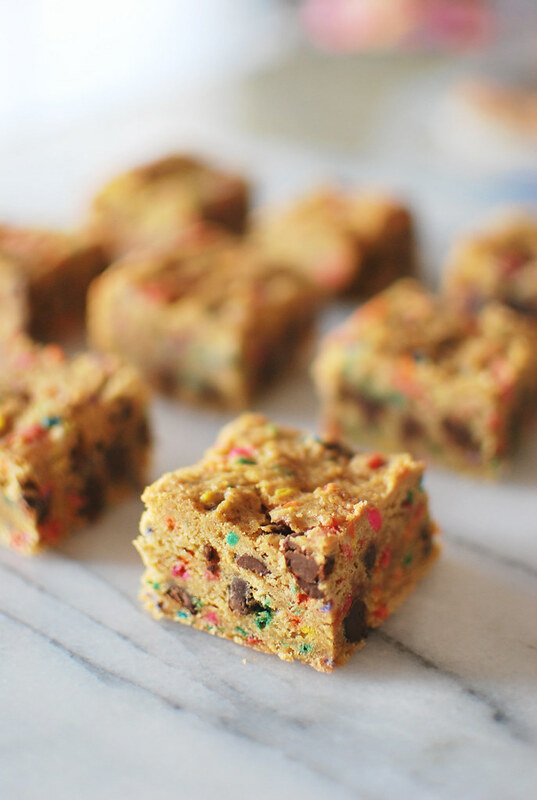 And I have to say, besides being a fun dessert, they're absolutely, ridiculously addictive. I've been trying real hard to limit how many of them I eat in a day, but today I'm going to loosen the reigns a bit because it is Friday after all. Time to enjoy a mid-afternoon snack now! Hope you all have a great weekend! Happy MLK Jr. Day! Recipe from Baked by Rachel. I've added notes next to the items it pertains to. 1. Preheat oven to 350°F. Lightly grease the sides of a 9x13 baking pan and line with parchment paper (I ended up using an 8x12 pan), leaving extra overhang to grab with later. 2. In a large bowl or stand mixer, beat butter (and/or shortening) until fluffy. Add sugars and cream together with butter. 3. Mix in eggs and vanilla, followed by salt, baking powder and flour. Mix, increasing speed as needed, until batter is smooth and no streaks remain. With mixer running on low, add sprinkles, mixing until just dispersed. 4. 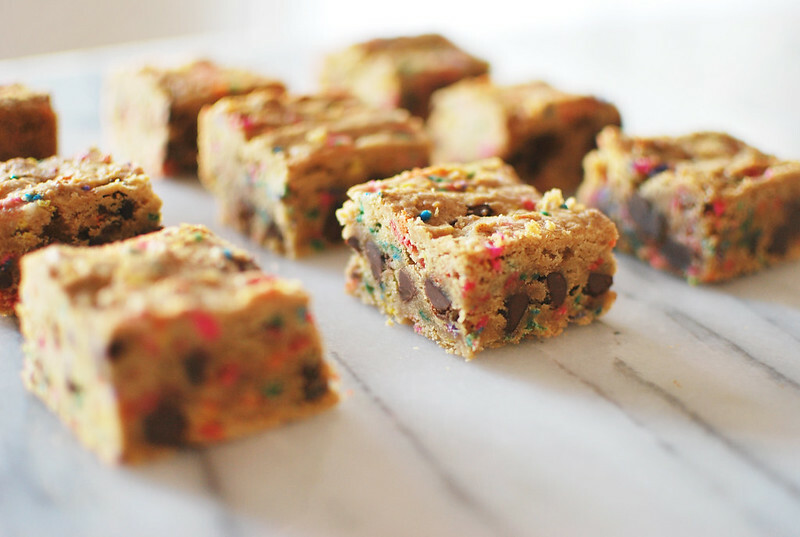 Mix in chocolate chips by hand. 5. Press batter into prepared pan, creating an even layer. Lightly grease hands if needed to prevent sticking or use a butter wrapper. 6. Bake for 25 minutes or until edges are just golden. I added 15 more minutes of baking time since I used a smaller pan. 7. Cool in pan on a wire rack. 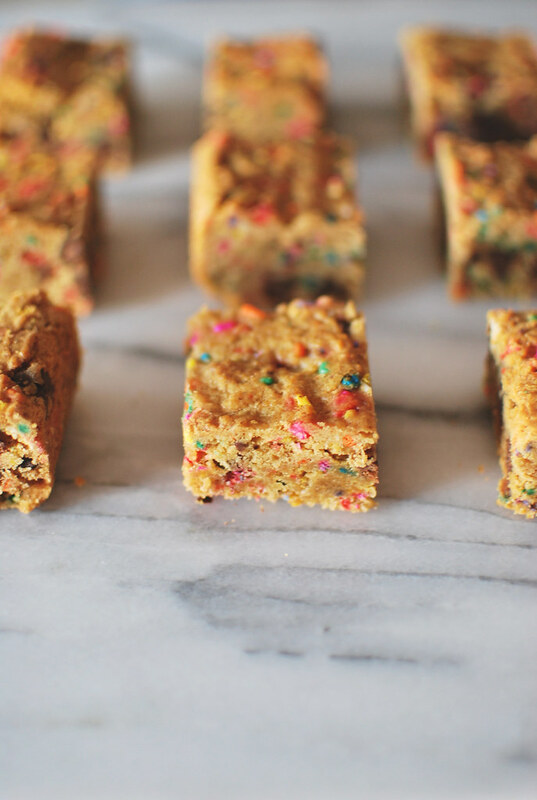 Remove blondies by grabbing parchment overhang. Place on a cutting board to cut into desired sizes. Store in an airtight container. (I'm not sure if it's because I used shortening or because I used a smaller size pan, but my blondie bars were on the gooey side and so I left them in the pan for a good 30 minutes after they came out of the oven).